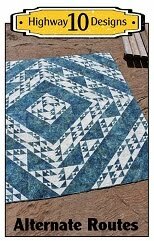 This is Linda’s All Roads Lead to the Sea quilt and the pattern is designed by Country Creations in Alberta, Canada. It is a beautiful pictorial quilt and she asked for custom quilting. I don’t get a lot of landscape quilts so this was a bit of a challenge for me but I enjoy a good challenge. I wanted to add a lot of texture but not distract from the piecing. Started with a simple piano key design in the outer border and large random swirls in the sky. I stitched in the ditch around all the landscape elements and details in the buildings and added glass panes to the larger windows. Pebbled the pathways with round or angled pebbles. Added gentle waves in the water that flow into the bays, stipple and meander in the grasses and a meander that has the occasional tuft of grass ( my friend Desley’s idea). The batting is Quilters Dream Blend and I used 18 different colours of So Fine thread! I think that is a record for me. Matching threads to the fabrics is really important for this quilt as I didn’t want the thread to compete with the prints in the fabrics, the goal is to just add texture. The backing fabric is a dark brown print so I used a light beige Bottom Line thread on the back and did not change the bobbin colour. This is Gail’s Blue Log Cabin quilt and she made it for a birthday gift for her cousins daughter who just turned 21. She had her involved in the process and had her pick the colours and pattern. Gail had a bundle of Blueberry Crumb Fabric by Blackbird Designs and used that for the blue. When we were discussing the quilting options I sent her a picture of a log cabin quilt I did for another client and she love what I did on that one so that was an easy decision. Diagonal lines in the blue and open feathers in the cream. I used blue and cream So Fine thread and Quilters Dream Blend batting. 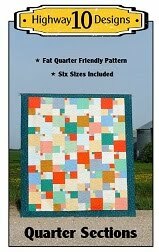 This is Sandra’s Cora Quilt and it is a pattern designed by Fabriculous Quilt Shop. 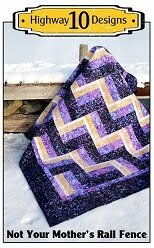 I just love the large Ric Rac in the inner border, that really makes this quilt special. 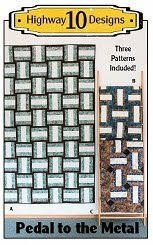 She purchased this as a kit from Fabriculous, here is a link to their website. Sandra left the quilting design up to me and at first I thought I would do free hand swirl across it as she said this will be a dragger quilt for her granddaughter. But then changed my mind since the batting is Dream Puff and the backing is Minkie, I really wanted this to be a squishy soft quilt for a toddler to drag around, so more open quilting was the way to go. I decided on a large orange peel design since I had a perfect grid to work with and I also wanted to try more of my new Quilted Pineapple Templates. This time I tried the 10 inch template and I love how it turned out! I stitched in all the ditches and around the Ric Rac and then added a simple X in the outer squares for contrast. This is Wendy’s quilt and it is very dear to her heart as she made it from fabrics that her late daughter had purchased. Wendy made this quilt for herself and I hope it provides her with comfort and happy memories of her daughter when she cuddles under it. Wendy asked that I pick the panto so I chose Belladonna as the center panel fabric has beautiful tulips and the Belladonna design reminds me of tulips. I used a light beige So Fine thread on top, light teal Bottom line on the back and Quilters Dream Blend batting. I’m very excited to share Sandra’s Lug Nuts quilt with you. 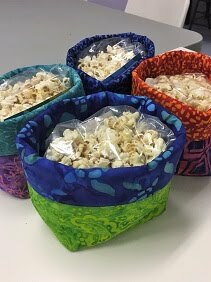 Lori and I helped her pick fabric for our pattern at our guilds Quilt Show last April and we ended up doing something different. The Lug Nuts patterns calls for 3 light fabrics ( same colour), 3 medium fabrics ( same color) and 3 dark fabrics ( same colour). Well Sandra wanted try something different and we picked three colour but instead of each colour being a light, a medium and a dark, we had 3 colours in each light, medium and dark groups. Follow so far? So there was a light, medium and dark in each pink, purple and teal. I wasn’t sure if this would give the quilt the same effect as our cover quilt but after seeing it done I have no hesitation to say it definitely works!! Our Highway 10 Designs patterns usually have a masculine feel to them but Sandra’s quilt is very feminine so I wanted to make sure I quilted it with a feminine design. I chose Deva Vu for the panto and love how it looks! Used pink So Fine thread on top, white Bottom line for the back and Quilter’s Dream Blend batting. We are under an extreme cold advisory right now, had –46’windchill this morning but once it dropped to –38’ windchill I ran outside and got a few pictures! 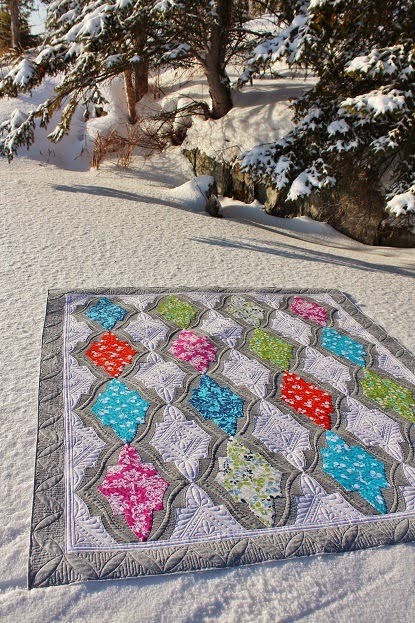 This is Yvonne’s Metro Medallion quilt and it is a pattern by Sew Kind of Wonderful. She requested custom quilting and it took me a bit of time to figure out a plan but once I had that in place it came together well. I had a lot of inspiration for the designs from the Sew Kind of Wonderful blog and Jenny’s quilting of their cover quilt which you can see here. Yvonne didn’t add the diamond pieces in the center of the white background so that gave me a space to play. I added my favorite pedal feather motif and surrounded it with pebbles and then did a similar flowing feather motif Jenny used on hers. It filled the space beautifully! I then did the two curved lines in the grey fabric and the U-turn design on both sides of that to make the curved line pop! 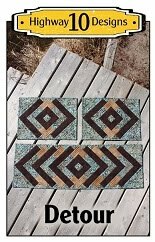 For the border I used a pumpkin seed design and added the U-turn quilting on both sides to make them pop as well. I originally started to quilt my favourite curved echo border design but stopped and changed it to this. I think it has a more modern feel that the quilt wants. One thing I try very hard to do when I’m quilted a dense design is to make sure the quilting designs are even in size and spacing so it will lay flat in the end. It really helped that Yvonne’s piecing was excellent so I wanted to make sure that the heavy quilting designs didn’t warp it. I was very happy when I took it off the machine and laid it on the floor to see it perfectly flat! I used quite a few rulers on this quilt so thought I would share those with you. First is my most used ruler, the Little Girl ruler from Gadget Girls. I use this one for all my stitch in the ditch, just love it! It is getting a bit dinged from a few close calls hitting the hopping foot but it has survived my abuse well. This was the first ruler I bought and would recommend it to all beginner quilters. The next ruler is a new purchase, it’s the QCR Sidekick made by Sew Kind of Wonderful and it has the same curve as their Quick Curve Ruler. I used it to stitch in the ditch around the medallion designs and to add the curves in the grey fabric. It worked very well and even though you have to switch between two rulers as you go around the design I didn’t mind that as having the right curve that matched the piecing made that worth while. I know I will get good use out of this one as I love making their patterns! Then for the diagonal lines in the Medallions I used the Crossing Hatching Ruler from Topper Tools. This ruler attaches to your leveller bar and they make a few styles for different machines. This was the second ruler I bought during my first year of longarm quilting and it has paid for itself may times over! Last but not least is my newest purchase, The Quilted Pineapples Curved Templates. I used her 8” template to make the border design and I was very impressed with the quality and marks on this ruler. Think this might be my new go to curved ruler as it fits nicely in my hand and easy to use. I will have all the sizes soon so look forward to trying them all out! So that was a lot of rulers for one quilt but it is nice to get the opportunity to use them. This quilt took me 4 days to quilt and it is a lap size. Quilting this intensely is great for the brain and the creative spirit but I think I’m ready for a panto next! 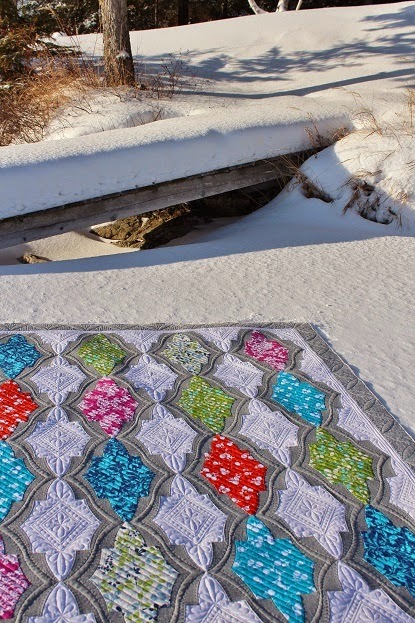 Wish I could have gotten outdoor pictures of this quilt but it has been snowing on and off for days now and haven’t seen the sunshine in awhile! *Edited on Feb 11 to added a few snow pictures!